This bike dates from about 1990 or a little before. It was made in the former East Germany by TEXTIMA, who made bikes for the DDR national team. It has several unique features like a fork crown made on a lathe rather than imported from a western European country. The Soviets had bikes that similarly stood out from the bikes of the “free world”. More than any so-called “track bike” from NAHBS darling Cherubim, I would have this bike. It’s way too big for me to ride, but no one can ride those Cherubim bikes either. When talking about track bikes, maybe the names Nagasawa or Cherubim get tossed around and people talk about Japanese keirin racing. 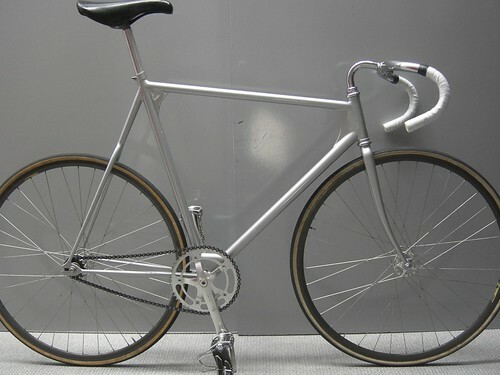 Part of the genesis of the fixie trend was a fetishism for Japanese track frames and components with approval from the professional keirin association (NJS). But for 12 year old me, before I knew what the Tour de France was or heard who Greg Lemond was, I knew what match sprint was and I knew the names Mark Gorski and Nelson Vails. And while Koichi Nakano won ten consecutive professional match sprint world titles on a Nagasawa, it was common knowledge at the time that the amateur championship had the faster riders because “professional” athletes were barred from the Olympics. While sprint-style riders in Japan made lucrative money on the professional keirin circuit (indeed, far more than competing in UCI events), riders in the Europe rode for national sports programs. Yet in many ways, these amateur riders were more professional, especially in the USSR and DDR where children with athletic potential were identified at a young age and fast-tracked to special schools with training programs in the sport for which they were best suited, cycling among others. All to enhance national prestige through sport before the end of the Cold War. In the match sprint, the riders from the USSR and DDR were the biggest badasses on the planet. Most likely due to the influence of a LOT of juice, they were physically immense and strong. East German Michael Hübner won world championships match sprint as both amateur and later a professional after the Olympic rules changed to allow professionals. There is a story that after Germany’s reunification, he signed a contract to a tour on the Japanese keirin circuit. The keirin officials took issue with his non-NJS handlebars and stem that he had brought with him to race. So Hübner had NJS items installed on his bike, and then as the officials watched he pulled the bars bent just with upper body strength alone. After that, he was exempted from NJS equipment requirements. One interesting thing about the TEXTIMA bike compared to keirin bikes is the geometry. Keirin bikes tend to have fairly upright angles with lower bottom brackets. As a whole, Japanese keirin riders frequently have a very forward position on the bike, like they are all bunched up over the front wheel, and Japanese tracks are usually big 400-500M ovals. Hübner’s match sprint bike has slacker angles but a higher bottom bracket to facilitate low speed maneuvering on shorter European tracks that have steeper backing.